Just 85Kms from my childhood hometown Hubli, Dandeli has been a frequent destination for me and my family. I had been to this place many times in the past, like pre-2005 years. I have done extensive trekking and wildlife viewing those days. In the last decade Dandeli has emerged as a destination for adventure activities around Kali river. For me Dandeli is synonymous with 'river rafting'. For bird watchers it means Hornbills and much more!!! Anshi National Park and Dandeli Wildlife Sanctuary are together given the status of Anshi-Dandeli Tiger Reserve. The forest is bustling with Indian Gaurs which are locally popularly known as bisons. Also seen are Ruddy mongoose, wild boars, peacocks, few common deer species like barking deer and spotted deer. There are tigers which are hard to spot. It is a bird watcher's paradise too! It is home for three hornbill species- Great Indian, Malabar pied, and Grey. Also, the river Kali is home for crocodiles and huge fish. Well, recently I was in Dandeli and stayed in Dandeli Jungle Camp. The camp is located in the village of Pradhani 12KM from Dandeli town, right in the forest area. Camping in such places is not always possible! The camp has basic facilities that you can expect in a forest. Clean rooms with basic furniture and bathrooms. It is totally meant for jungle experience. By that I mean to say- no AC and no hot water running in the tap 24 hrs. Food is very simple but good considering I am a vegetarian. I don't know much about non-veg options. Though the camp is located in the buffer zone of a sanctuary tariff seems to fit the budget. The manager and other staff are very attentive and friendly. The manager can arrange for all the adventure activities customized for you and your group based on your taste and preferences. For more info visit their website. Coming to things-to-do, I love the water and white water rafting! Though Kali river is dam-controlled there will be plenty of water throughout the year. It would be better to check prior to booking if that is the only interest. Coracle ride is another way to enjoy the water. Very peaceful. But I get bored to just sit in that floating disc for a long time. But there is some incentive :) When the river is running low during winter the crocodiles are seen basking on the rocks. I sighted only one which ran into the water after sighting me on the other end of that tiny island. Hornbills are also seen on the trees on the banks of the river. Early morning nature walks are very pleasant too. 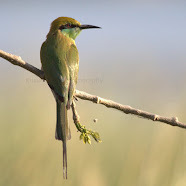 The guide from the camp is very good at spotting these little winged wonders. One could go for a longer trek. I went on a Jungle Safari and was surprised not to see much other than many hornbills. During my earlier visits I have seen a lot! The sunset point offers a great view of the valley and is nice to sit for a while. These are few things I did in this trip. There are other places nearby like Kavala Caves and Sintheri Rocks. I had been to these places during my earlier trips. Note- This trip was arranged by Dandeli.com a website aimed at helping visitors plan their trip customized to their taste and budget. The review opinions are solely based on my personal experiences at the camp. Few lines on Responsible Travel- There are not many incidents of crocodiles attacking tourists, but there are incidents where tourists attacked a forest official. Read the article on The Hindu daily. I wish, as tourists we all understand our responsibilities and behave accordingly- abiding by the law, not feeding wildlife and at least not kill someone who is doing his/her job! Always go with the authorized organizations for any adventure activities or wildlife sighting. Wild animals are wild but we are civilized! Looks a spectacular setting to see wildlife up close. Yes, birds and smaller mammals are plenty though the big cats are not frequently seen! Nice write up, Kusum. Dandeli is definitely a haven for nature lovers. Great, this can be only defined by true nature lover. Thanks body to share your opinion about natures. 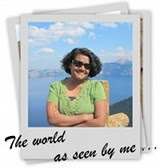 What an incredibly beautiful place and your photos are the next best thing to being there, Kusum!! Thank you for sharing!! WTH? That squirrel is so strange. It is not a common squirrel :) Its a giant tree squirrel lives high up in the trees. Great looking place - I have always wanted to see a hornbill - and the squirrel is great! Thanks Stewart! Yeah the squirrel is a giant! Kusum, this park sounds like a wonderful place to see the wildlife and the birds. I love your Hornbill photo. Thanks for sharing, have a happy week! What an interesting post. I love reading about other parts of the world. That squirrel is huge and I would love to see a Hornbill. Thanks for your visit to my part of the world. Beautiful park. That hornbill is one awesome bird!! Very exotic landscape. That hornbill is terrific! Incredible place -- that hornbill is amazing and so is the mongoose. Beautiful jungly feel to the atmosphere. How neat that you got invited to stay there. Wow! What fabulous scenes and the little animals are amazing, too! The travel information which is provided by you are very informative who want to travel this place. This type of place ar very good for all the age group. Thanks for this useful information. Hi wonderful blog Kusum. I love wildlife and these pictures are so beautiful, especially the one with squirrel (Damn cute). Malabar Pied Hornbill is quite similar to the Great Hornbill. It think they both are the same (Am I right? ).